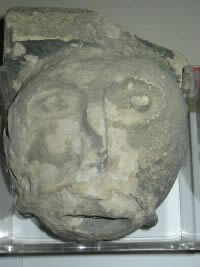 These two faces, presumed to be relics of Saxon Steyning, came from the chancel of Saint Andrew's church. On the left, the head is wearing a crown and thought to be King Edward the Confessor. In 1047 King Edward gave the church with its port and surrounding land to the monks of Fécamp Abbey in Normandy. The head on the right has a moustache, which was a distinctly Saxon fashion. King Aethelwulf was buried at the church in 858 but since there is no sign of a crown on this head it seems unlikely that it represents a king. Another identity for the head on the right, and possibly both heads, is under investigation. So called spectacle eyes and moustaches are the common features of 'Celtic heads'. These appear on Celtic monuments throughout Europe. Similar stone carvings are also found built into churches or in the foundations beneath and are surprisingly common discoveries. 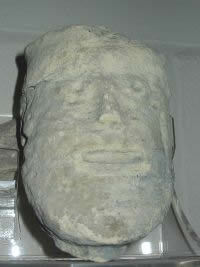 The severed head has an association with very ancient beliefs. There are Roman reports of Celtic Gauls leaving the battlefield with the heads of their enemies hanging around the necks of their horses. Trophy heads were preserved and kept in chests or wall niches. The story of Bran the Blessed, whose head was buried beneath what is now the Tower of London for the protection of England, is told in the medieval folklore manuscripts known as the "Welsh Triads". Such superstitions persisted longer than we might imagine. Celtic heads have survived above the doorways of churches and old houses, as well as in less prominent places, but they were never Christianised. That all these heads are actually of Celtic origin is seriously doubted, though some clearly are. Many are older than their architectural setting, but impossible to date. Researchers have speculated that Celtic heads were carved by stone masons as a form of protective magic until as recently as the 17th century.